The skin protects us from micro-organisms, dangerous bacteria, and toxins; it regulates temperature; provides sensory information; and excretes wastes. Oh yeah, and… clear, fresh, luminous skin is beautiful. The most effective, inexpensive, simple skin care practice is to cover the skin during sun exposure using umbrellas and protective clothing including scarves, hats, gloves, sun sleeves and more. 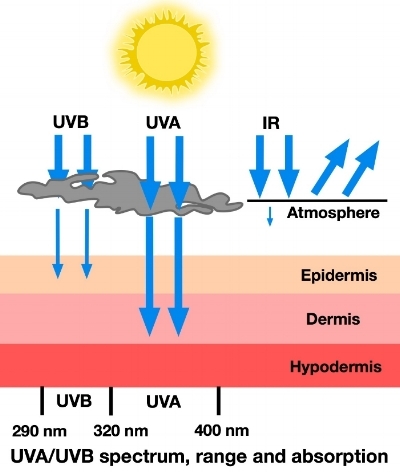 UVB rays penetrate the epidermis, are blocked by clouds and are at their strongest from about 10 AM to 3 PM. UVA rays penetrate the dermis, degrade collagen synthesis, are not blocked by clouds and are strong from dawn to dusk. If you are in the southwest, sun protection is a year round must. I began covering up in the mid-1980’s. Working as a geologist/hydrogeologist, I spent long hours in the Arizona sun. My instinct was to cover up. I purchased silk clothing, scarves and cotton gloves from the second hand store and covered up every time I worked in the sun. I wore a tank top covered by a long sleeve silk shirt and silk pants. I would wet the shirt and scarves during hot weather to stay cool. This practice protected my skin from direct sunlight, scrapes, and dirt. I began to cover up at home while doing yard work and ultimately began covering up during any outdoor activity. I wear a physical sunblock 365 days a year to reduce exposure from reflected light. Apply sunscreen to the backs of the hands, neck, chest, arms and other areas to reduce exposure. In case you are wondering, despite decades of using sun screen and skin cover ups, my vitamin D levels are quite high. One way to greatly reduce sun exposure is to cover up while driving to protect the hands, arms, chest, neck and face, that are often exposed to direct sunlight. Using a scarf for sun protection. It is easy to keep a pair of sun gloves, sleeves, and scarves readily available in the car for use every time you drive. Currently, most sun gloves and sleeves are available in beige. Boring, but I’ve worn them anyways every car trip. I recently sewed a pair of colorful sun sleeves that are much more fun to wear! You can purchase protective clothing with UVA/UVB ratings or wear clothing with a tightly woven cloth. The tighter the knit or weave, the smaller the holes and the less UV that can pass through. Open weave fabrics provide much less protection. A shirt with an Ultraviolet Protection Factor (UPF) of 50 allows just 1/50th of the sun’s UV radiation to reach your skin. This would provide excellent sun protection, in contrast to a thin white cotton T-shirt, with a UPF of about 5, that allows passage of 1/5th of the sun’s UV. Australian studies show that lycra and elastane fabrics have UPFs of 50 or higher, followed by nylon and polyester. Read additional sun protection tips here. A few tips: During warm weather wear a tightly woven long sleeved linen shirt. Note that tightly stretched fabrics provide less protection. 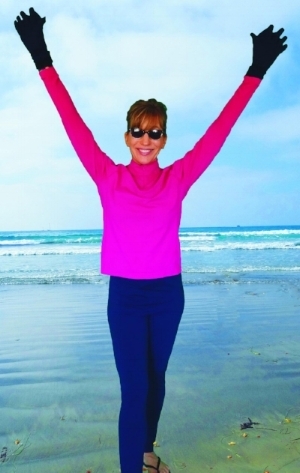 Sun protective garments should cover a large amount of skin. Use large brimmed hats with a scarf to protect the sides of your face. Seek shade. Bring your own shade, carry an umbrella. Remember, sun-protective clothing doesn’t have to be boring: it can be light and bright and fashionable and fun. And when chosen and used correctly, it’s the best form of sun protection you can find. After the sun goes down, strip off those sun cover ups and enjoy the health and beauty of pampered skin.